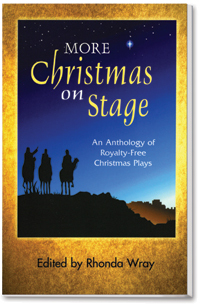 This stylistically diverse collection of 23 plays will provide your church, school, or community theatre with years of royalty-free Christmas season programming. These scripts encompass the whole season, from Advent to Epiphany, and include all variety of casts and style. With the wide assortment, you’re sure to find scripts to fit your actors, from children to adults, from casts as small as one to a whole Sunday school class. The anthology features both the secular and the sacred, encompassing all Christian denominations and worship style preferences, from contemporary and informal to traditional and elegant. There’s a fair share of humor added as well! Read more...All the scripts have been audience-tested with resounding success and are user-friendly, including production suggestions describing how to stage the performance easily and with minimal rehearsal and staging requirements.